From home to get the newspaper – the slow way. A hop and a skip from my front door and I am on the Sheep’s Head Way heading towards Durrus. 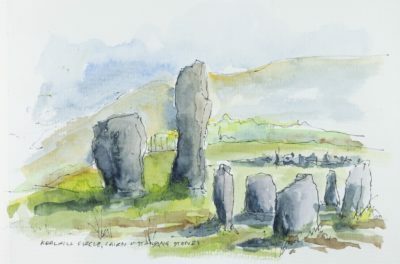 First stop is the Gorteanish stone circle, looking a little unloved these days with new houses going up behind it, impinging on the sightline from the portal stones over the recumbent to Roskerrig mountain – but one of the advantages of sketching is that details can be left out. Over the rough ground above Ahakista, across the road and I am out into the peace and quiet above Dunmanus Bay. 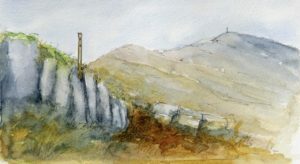 Rossnacharagh, Baunta, Tullig, Kealties, Brahalish, Gearhameen – the string of townlands running down the southern slopes of the Sheep’s Head as it widens towards its apex in Durrus. 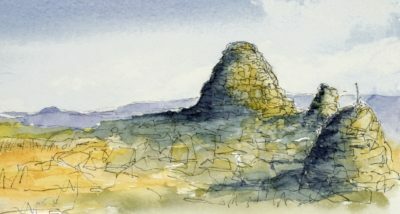 Ros na Cathrach: ‘Headland of the fort’; Na Bánta Buí: ‘Yellow grassland(? 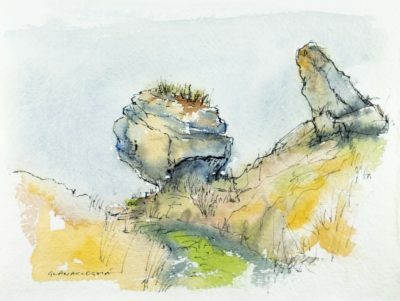 ); Tullach: ‘mound’; Caolta: ‘narrow strip of land’; Breach Lios, ‘spotted fort’; Gaortha min: ‘small wooded glen’ – the names that invoke the landscape so evocatively. Through Tullig, the ash-blond grasses are thigh-high. I stop to speak to two Dutch people who are exploring the route and I meet no-one else today until Durrus village. 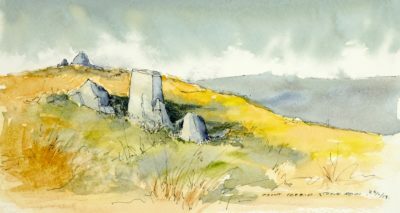 The route follows a small road as it winds through Brahalish, leaving it briefly to visit a bramble-covered ring-fort before heading off into fields again, over rough ground and past a lonely cilleen, dark under trees and recently fenced off from the path. Back onto the road to a shady stile and more field tracks before Cul na Long (‘Nook of the Ships’): a fortified house, dark and ivy-clad. It has an eerily cold feel to it today as the afternoon light begins to fade into evening. Up the muddy track that is part of the old military road down the peninsula with midges dancing in the few shafts of low sunlight filtering through the trees and then down to St James church where the path leads through the churchyard standing at the head of the bay, curlew and heron feeding on the mudflats at low tide. Herself arrives to collect me as I enter Durrus village where the Christmas tree is already lit on the small green in front of Ross’s pub. This an easy route on the main Sheep’s Head Way. It is well marked although going through Brahalish there are a few turns that are easy to miss if you are not concentrating, including the one that leads up to the ring-fort. It is also worth noting that coming towards Durrus, the path actually goes through St. James churchyard to join the coast road. Love this post! Especially the fortified manor house – yes, possibly even more than the stone circle. Sounds a lovely walk too! 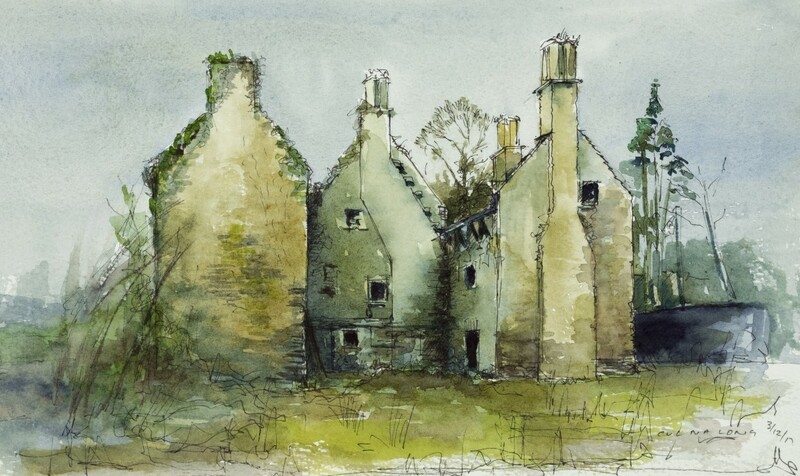 Wonderful drawing of Cul na Long, such an important building yet mainly ignored.